Cervical cancer is the leading cause of cancer deaths for women low- and middle-income countries, including Botswana, where 75 percent of cervical cancer patients suffer from advanced forms of the disease. These patients can face wait times as long as five months after diagnosis before receiving lifesaving treatment. A new, multidisciplinary model of cervical cancer care developed by a University of Pennsylvania team based in Botswana cut the delay between diagnosis and treatment by more than 50 percent, according to research published this month in the Journal of Global Oncology. Limited access to preventive screenings combined with the HIV epidemic are driving the high rate of cervical cancer in Botswana, which has the second highest HIV rate in the world. The risk of developing cervical cancer in women infected with HIV is three- to six-fold higher than those who are HIV-negative. In Botswana, more than two-thirds of all cervical cancer cases occur among women who are also living with HIV. However, radiation therapy is not available at in public clinics in Botswana, requiring patients to seek care at private hospitals, which can be a cumbersome process with wait times as long as five months. 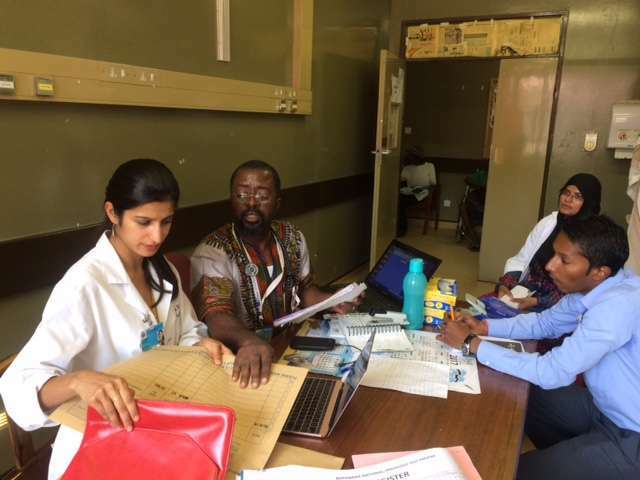 "With so many women suffering from advanced cervical cancer in Botswana, long delays between treatment and diagnosis can mean the difference between life and death," said Surbhi Grover, MD, MPH, director of Global Radiation Oncology in the Perelman School of Medicine at the University of Pennsylvania and head of Oncology at Princess Marina Hospital in Botswana. "We saw an urgent need to develop a care program that gives cervical cancer patients the treatment they need as quickly as possible." Grover and her fellow researchers at Princess Marina Hospital developed a multidisciplinary team (MDT) approach to streamline care and communication between providers and get patients to treatment facilities faster. Weekly care team meetings were established across providers, including radiation oncologists, clinical oncologists, gynecologists, nurse coordinators, and palliative care specialists to discuss patient cases and develop treatment plans. The teams also worked to together to submit paperwork and other documentation, further reducing delays in treatment and simplifying the overall process. "While this type of model might seem common in the United States or other developed countries, it's actually a quite complicated process that lacks a global standard of guidelines," Grover said. "We saw many different models across the world, but no published outcomes on how to successfully implement an MDT approach for cervical cancer care." Over a six-month period, the team saw 135 patients, 60 percent of whom were diagnosed with cervical cancer and 42 percent had locally advanced cancer the required chemo-radiation. However, thanks to the MDT model, 62 percent of those patients required only one clinic visit to coordinate care, reducing the time between diagnosis and treatment initiation by more than 50 percent, with the median delay from biopsy to treatment initiation cut to 39 days from an average of 108 days before the new care model. "With this model, we've shown that the MDT approach works in a resource-limited setting and actually helps address several challenges providers face," Grover said. "Many of our patients must travel long distances or face other barriers that prevent them from returning to the clinic for multiple visits. Offering patients a comprehensive treatment plan during one clinic visit is a game-changer." Similar MDT models are being developed for head and neck cancer, breast cancer, and palliative care in Botswana. A follow-up clinic is also being piloted where patients with gynecological cancer receive continued follow-up care after chemotherapy and radiation are complete. All patients seen in the Penn MDT clinic will be linked to this new clinic and will receive regular communication about follow-up care. "What this approach really shows is the importance of integrated care and treatment models," Grover said. "We hope our MDT model will be applied on a broad scale across many different illnesses and clinics in resource-limited settings worldwide."